Located minutes from the centre of London, LSBU has been preparing and developing students for their working lives for over 125 years. Here at LSBU we put our students first and almost 2,000 International students from over 130 countries have chosen this University. Studying an undergraduate degree in Italy and a studentship in the USA, Federica Ceretti believed she needed more and wanted to specialise in marketing. Moving to the UK, she chose LSBU, due to the reputation of our Marketing department and the high rates of employment among our postgraduates. Find many more international student stories in our Story finder. We're committed to giving our students the very best opportunities and education. This means we give our students not only the qualifications but the skills and knowledge for their careers. LSBU has been given the award for Entrepreneurial University of the Year at the Times Higher Education Awards. The accolade celebrates the entrepreneurial support offered to students, graduates, staff and the local community led by LSBU’s Research, Enterprise and Innovation team, based at the Clarence Centre for Enterprise and Innovation, with support from academics across LSBU’s seven Schools. Our teaching practice is informed and many courses offer work experience opportunities. With our strong employer links and numerous partnerships, all of our courses are professionally accredited or developed in partnership with relevant professional bodies. We're University of the Year for Graduate Employment (The Times and The Sunday Times Good University Guide 2018). Download a copy of our latest prospectus for International students (PDF File 7,583 KB) or complete on online course search. We offer a wide range of scholarships and discounts for international students including Nationality Scholarships, fee-discounts for LSBU alumni, plus a 5% discount for early payment of Tuition Fees. To show our commitment, the University has committed over £1m in financial support to help well-qualified students from outside the EU meet their study costs. More about international scholarships. Whatever the course, we have the facilities to fully support it. Whether you spend time in our research and skills laboratories, workshops, media centre, theatre, library or Learning Resources Centre we have the appropriate technologies and expert support to complete your experience. We're committed to first-class facilities and have already invested over £50m in student buildings and learning spaces over the last few years. 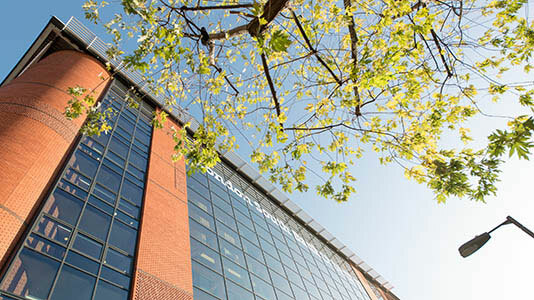 Our new Student Centre opened in September 2012 and The Clarence Centre for Enterprise and Innovation opened in a stylishly-refurbished GradeII listed building in 2013. Read more about our location. LSBU has been awarded Silver for teaching excellence under the UK Government's Teaching Excellence Framework (TEF). Our academic staff deliver an innovative curriculum. All staff enhance professional opportunities by combining their own knowledge of developed practice with education theory. As well as their academic backgrounds, you'll find staff have an impressive range of professional expertise and are often invited to act as consultants for external enterprises. As a leading provider of fully accredited professional courses and excellent industry links, a qualification from LSBU is recognised across the world. Read more about LSBU's partners and affiliates. Our staff have a well deserved reputation for offering personalised student support. Through this they enhance student achievement and satisfaction by providing individual and group tutorials, seminars, workshops, Personal Development Planning, careers sessions and a dedicated School Student Office. More about student support.